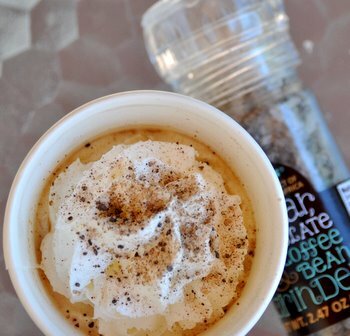 As much as I enjoy a good cup of black coffee, I also love topping a cup of coffee or a shot of espresso off with a dollop of steamed milk or whipped cream and a sprinkle of cinnamon or cocoa powder to add a little extra flavor and just generally dress up the drink. It is one of those little touches that somehow makes the drink seem fancier and me feel like slowing down to enjoy it – as I would do at a coffee shop, but might not necessarily do at home. 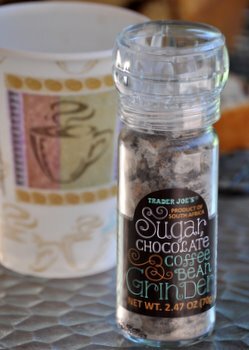 It was clear that the new Trader Joe’s Sugar, Chocolate and Coffee Bean Grinder is designed to make it easy to add this sort of coffee shop flare to your coffee drinks at home. The grinder looks like a pepper mill, but is filled with white and brown sugar, chocolate and coffee beans. A few twists of the cap and you have a sweet sprinkling on top of your drink! The mix is great, and because it comes out of a pepper grinder, everything has a very coarse texture to it, so you get both an attractive look and a lot of flavor from just a small amount of this mix. The sugar crystals are crunchy, the coffee is subtle and the chocolate just leaves a hint of richness on your tongue as it melts. I’m keeping mine by the coffee maker. TJ’s also recommends putting this on buttered toast, ice cream or other desserts. I can vouch for how delicious it is on top of buttered toast, and I’ll definitely be up for experimenting with it on other desserts that need a little spike of coffee, chocolate and sugar to dress them up.